Getting away from your phone and computer screen is easier than you might think. 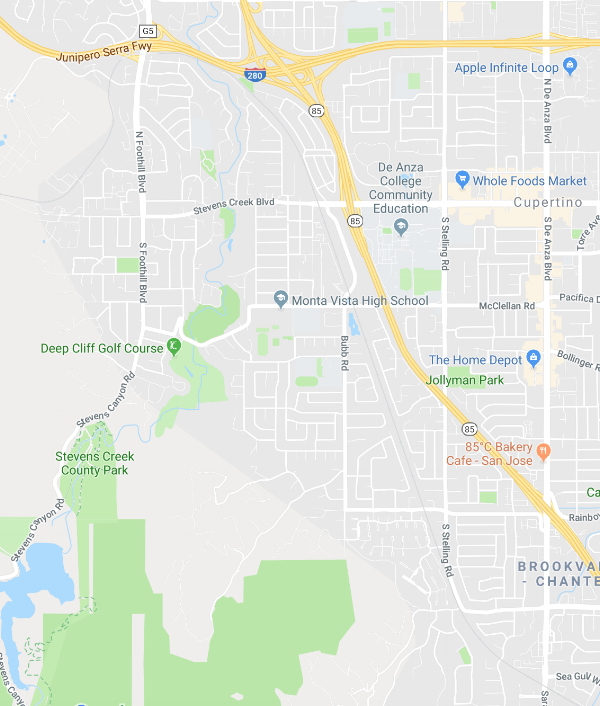 Ironically, only 5 miles from the Apple Campus, in the heart of Silicon Valley, is Stevens Creek County Park, a beautiful 1,063 acre area that offers widely diverse recreational amenities, including an 86 acre reservoir. Spending a little time outdoors for just an hour or two a week can make a significant impact on building a healthy body and positive mind set. What's more, you'd be surprised about how close a place to paddle might be to where you work or live. One of our goals is to help more people enjoy the outdoors more often, especially close to work or home. We know first hand the wellness benefits of getting outside and experiencing a bit of nature to help you get recharged and refreshed. Do you have a local spot that you're willing to share? Let us know! Hope you make time to get out on the water this week. Standup paddleboarding is a growing sport and there are several different kinds of paddleboarding you can do including racing, touring, surfing and downwinding. This past Saturday I had the opportunity to guide a couple and their son on a 5 mile downwind trip in Petaluma, CA. Downwinding is a concept that not everyone is familiar with. Generally speaking, whenever you paddle with the wind at your back you are travelling down-wind. Starting on a river or lake is best if you’re just learning as opposed to the open water of a bay or ocean. You should always do downwinders with a group of experienced paddlers who understand the currents and tides of the area you are going to. It is always important to have a back-up plan if the weather changes for the worse or there is a change in the direction of the wind. In addition to having the mandatory leash, and PFD, you should also have your cell phone or a radio in order to contact help if needed. You want to be standing in the middle of the board with your feet slightly offset and your knees slightly bent. This will help you maintain your balance as the board if it’s carried on by a wave and as it stalls in the trough between waves. Boats or jet skis going by can also cause waves and you’ll need to paddle into the wave, and let your knees absorb the wave and use your paddle to help balance and paddle forward until the wave is gone. With practice, you’ll learn the best way to take advantage of the wind at your back. So, if you haven’t tried downwinding, you should give it a go and see what it’s like! With the popularity of stand up paddle boarding growing across the ocean, rivers, and lakes, it's important to understand that, when things go wrong, they can go wrong very fast. That's why it's important that you assume a conservative and safety-conscious attitude when making decisions on the water, or even before you hit the water. Because this is a relatively new sport, people often forget how dangerous it can be and that safety precautions have to be taken before paddling out. To help you be prepared, we’ve put together some important advice on important safety gear, weather monitoring and the different types of paddling along with some helpful suggestions so you can stay safe on the water! One of the easiest ways to stay safe is to choose the appropriate paddling location. When you're picking your location for stand up paddle boarding, a good rule of thumb is to consider the four W's: wind, waves, water, and weather. If you're a beginner or novice paddler, you're going to definitely want to pick a location that's sheltered from both wind and waves. Otherwise, the ideal SUP environment for beginners and novice paddlers has warm water, good access for launching, lots of places to get out on shore, and minimal motorized traffic. If you're going to be dealing with cold water, cold air, or both, you're definitely going to want to dress appropriately for the conditions. As for safety equipment, it's important to know that stand up paddle boards are considered a vessel by the US Coast Guard. This means that you need to have a life jacket or PFD (personal flotation device) on hand if you're outside a swimming or surfing area. One of the most important things to have when it comes to paddle board safety is a leash. 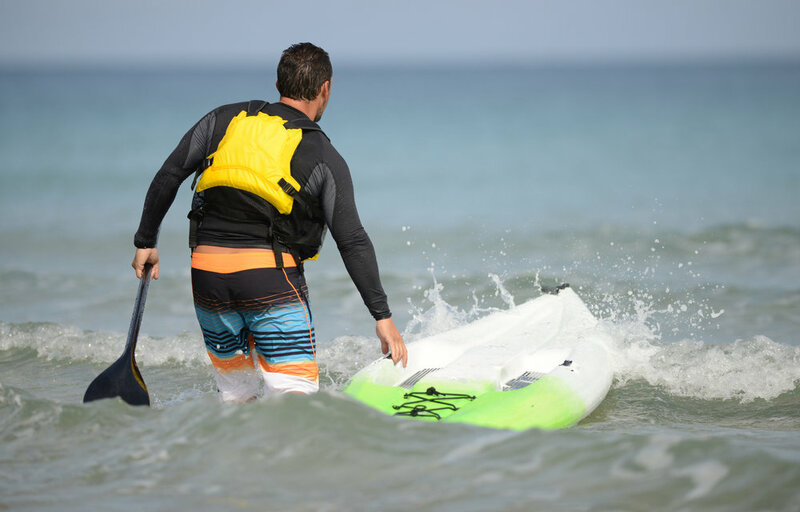 Whether it is your first time out or you are an elite paddle boarder, this piece of equipment could make all the difference if you get separated from your board. If conditions change quickly, a leash is what connects you to your board, which is your personal flotation device that can float away from you in seconds. The recommended leash to use is one that is a foot longer than your board, and the style depends on the water that you are paddling. If you are an ocean paddler, a straight leash is the best. This type of leash provides safety without the potential drag and tangle that might occur in turbulent white water. If you are paddling on flat water, a coiled leash is preferred since it typically stays on top of you board and will not drag in the water and slow you down. However, if you are a river paddler, you’ll need a specific type of quick release leash that prevents you from getting dragged in the event of you getting tangled in underwater rocks or branches. The second most important item in stand up paddle board safety is a PFD. Another aspect of standup paddle boarding you should know is that the board is considered a vessel when it is used “beyond the narrow limits of a swimming, surfing, or bathing area”. In these zones, it is required by law that you wear a United States Coast Guard approved flotation device every time you paddle out past the designated “swimming, surfing, or bathing area.” Here you want to use a life jacket that provides maximum buoyancy. Don’t be misled by many of the photos and advertising showing people on paddle boards with no safety equipment. For more information visit the US Coast Guards, Top 10 Tips For Standup Paddle Boarding. If you ever watch an experienced surfer before they go out in the water, they take their time and study and monitor the water, waves and wind before they jump in. Standup paddle boarding may look easy but it is important to note that it is a sport that demands awareness of dangers that may arise due to changing conditions. The first and most important weather condition to be aware of before paddling out is the wind. Higher wind speeds create choppier waters that are dangerous for inexperienced paddlers. On days that wind speeds are high, you can find yourself battling to make any progress and balanced as opposed to paddling out to where you had planned. Therefore, it is important to check the wind forecast before paddling out. As a general rule of thumb, if the wind is traveling under 11 mph, it is typically safe for you to paddle out at any skill level. However, when wind exceeds beyond 11 mph, you should think twice before you paddle out. Also note which way the wind is blowing as you paddle out. Is the breeze onshore or offshore? Getting blown away from shore is no fun and trying to paddle against it is a quick way to get tired and discouraged. Swells create bigger waves and therefore harsher waters to paddle on. Getting tumbled by a wave with a paddle and board can be challenging and takes some practice. It is important to never underestimate the power of the ocean. Even if you are confident in paddling out into calm waters, waves can add a whole new level of difficulty. If a swell creates bigger waves than you are used to at your local beach, you should consider you energy level and route of paddling before you go out. A basic understanding of tides (including rip tides or currents) and what causes them is key to ocean navigation on your paddle board. Awareness of the tides will prepare you as they can carry you very far in a small amount of time. Paddling back may take much longer than it took you to paddle out and therefore be exhausting if you don’t plan on it ahead of time. Therefore, it is important to plan your route around the tides so that you make it safely back to shore and avoid exhaustion. It is important to know the times of sunrise and sunset so that you are never paddling when it is dark. Knowledge of the times of sunrise and sunset can help you time out your paddle so that you never go out before it is light out and so you have enough time to get to shore before the sun sets. Surfline is a great tool that has all of this information for water locations around the world. While paddle surfing, it is important to be considerate of everyone around you. Be humble and know your ability level before surfing in zones around other paddlers or surfers. The lineup is considered the “impact zone” because you are putting yourself in high danger of potential collision. Beginners should never paddle into a crowded lineup filled with other surfers, because surf skills come from experience. To make it easier to paddle out, you can also search for the easiest way out; whether it’s a rip current to assist you to the lineup or a channel. Always use good paddle surfer etiquette by being courteous to other surfers and staying out of their way if you’re a newbie. The current of a river can be fun for paddle boarders, but also dangerous as you can get dragged by it once tangled in underwater branches. You want to avoid being submerged or dragged and you can do this by using your detachable leash in order to stay close to your paddle board, your biggest flotation device. Paddle boarding with a friend or in a group is always a good idea because it’s more fun and much safer. It is always a good idea to use the buddy system when on the water because you never know when a sometime might happen to you. A mishap could be as little as your leash snapping off shore or something more serious. If somebody else is there when this happens, that somebody can either help you or call for help. We hope you were able to learn some valuable safety pointers as we believe that the use of safety gear, awareness of what to monitor before paddling, and knowledge of the different water types, are the tools you need to have a safe and fun paddle board session. Are you looking for some eye candy the next time you paddle your board? Do stunning backdrops, snow-capped mountains, mangrove forests, alpine lakes, lagoons, emerald-green rivers and tropical beaches tickle your fancy? 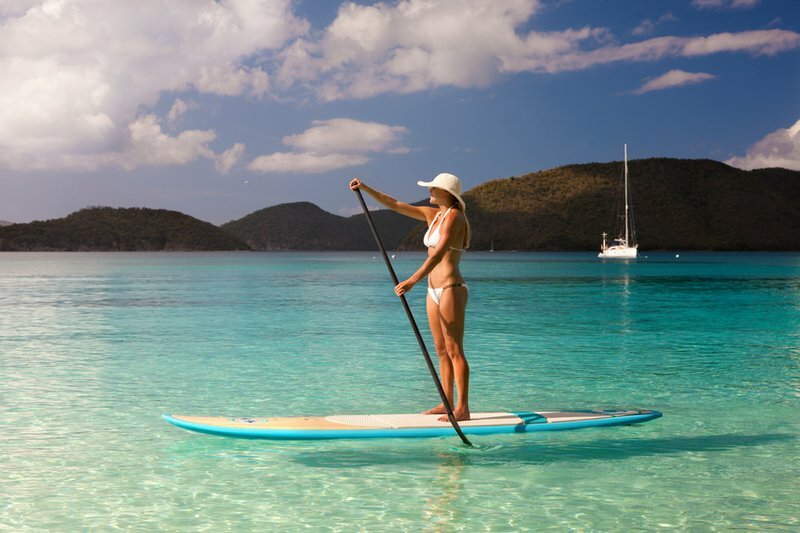 Then you’re in luck, because the world’s stand-up paddle boarding hotspots have them all! To help you find your next SUP oasis, we’ve put together a list with the world’s most epic stand-up paddle boarding trips you absolutely need to take in your lifetime. One of the most enchanting places in the world, culturally rich and boasting abundant wildlife and ecosystems, New Zealand is a bucket list destination. Its many lakes, rivers, beaches and bays surrounded by rocky mountains have landed it a place on our list. Northland’s Bay of Islands, with a subtropical climate and warm water all year round, is one of the best places for SUP in New Zealand. Not to mention that a pod or two of dolphins might tag along for the ride. Auckland and Raglan are well-known SUP hotspots, the latter being regarded as the quintessential New Zealand surf town. If you’re looking for a true sense of adventure, head to Lake Wanaka, New Zealand’s fourth largest lake. 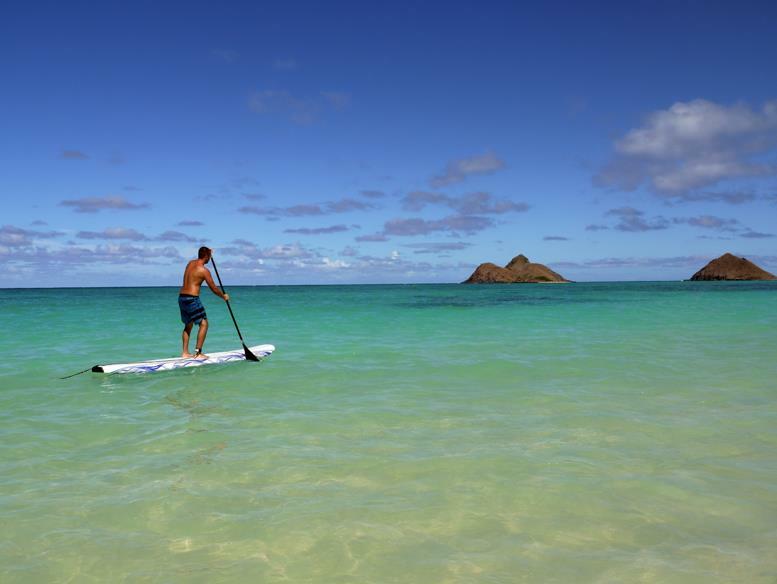 You can never go wrong with the birthplace of stand-up paddle boarding – Hawaii. Sunset Beach on the north shore of Oahu is famous for its big wave surfing during winter. During summer, the waves are smaller and friendlier, just perfect for paddle boarding. Those seeking a bigger challenge can paddle from Sunset Beach all the way to Waimea Bay, a 4-mile (6.5 km) trip. Sunny and warm Oahu has plenty of other SUP spots worth hitting, like Puaena Point, Haleiwa and Lanikai Beach, which are favorites among stand-up paddling beginners. Water temperature in Oahu is usually a pleasant 80 °F (27 °C). With almost the entire state surrounded by water, it is no wonder that the SUP community in Florida is flourishing. The coral cay archipelago of Florida Keys off the southern coast of the state offers literally hundreds of spots to launch your paddleboard. With a rich marine life that includes stingrays and manatees, mangrove forests, a diverse ecosystem and Caribbean-like waters, Florida Keys is an island paradise that’s best explored on a kayak or SUP. Paddleboarders can take advantage of the trade winds to cover long distances. When there’s no wind, the paddleboard can be used for fishing, SUP yoga, meditation or simply gliding in a slow, laid-back pace. Back on land, Florida’s Fort Lauderdale is often referred to as the ‘Venice of the East.’ Its winding canals that empty in the Atlantic make it one of the most scenic SUP destinations in the USA. With over 9,000 miles (14,500 km) of coastline, azure waters and sandy beaches, Mexico is one of the best surfing destinations on the planet. Quality surf awaits on both the Pacific coast and the Gulf of Mexico, and there’s always a cool wave to catch throughout the year. Puerto Vallarta is a culturally rich city that offers excellent SUP opportunities for all levels. Here, Banderas Bay, with its warm and calm water, is a Pacific haven. Los Muertos Beach is the most popular and active when it comes to water sports, and you can expect to see sea turtles, dolphins and humpback whales while paddling here. The small tropical town of Sayulita is considered the SUP capital of Mexico. Beginner and pros alike are guaranteed to have a good time, as a growing SUP community will welcome them. Cancun and Punta Mita are excellent locations too, great for the whole family. A small country counting only two million inhabitants between the mighty Alps and the Adriatic Sea, Slovenia is one of the most water-rich countries in Europe. This can only mean one thing – a SUP paradise. Stand-up paddling is relatively new to Slovenia, but it has seen a rapid growth these past years thanks to the country’s pristine nature and numerous flat-water alpine lakes and gently-flowing rivers. In Slovenia, stand-up paddle boarding is as diverse as the country itself. There’s even urban SUP here. After all, what better way to explore the picturesque Old Town of the capital city of Ljubljana than by paddling your way through it? The unbelievably picturesque Lake Bled is on top of everyone’s list, an alpine lake that is home to Slovenia’s only island. So are paddling down the emerald-green Soča River and Savica River and on Lake Cerknica. It may not be the first destination that springs to mind when thinking about SUP, but British Columbia (B.C.) is a hidden gem with plenty of surprises in store. After all, it is a mecca for outdoor enthusiasts and a popular destination for kayakers and canoe trippers. Why should stand-up paddle boarding fall behind? With lakes, rivers, a maze of waterways along the rugged central coast, no wonder B.C. has a thriving SUP community. There are so many amazing spots to paddle it would be tough to list them all. So we’ll just mention what we believe are the best – the coastal waters of Tofino, Kalamalka Lake in Vernon, Muncho Lake, Emerald Lake, Whistler and the west side of Vancouver are the places to start for a scenic SUP adventure. An archipelago of 40 coral islands surrounded by turquoise waters, the Turks and Caicos Islands are an SUP haven. Explore the mangrove swamps and reefs abounding in sea turtles and schools of colorful fish, all the while watching herons and nurse sharks swimming underneath your board. Turks and Caicos Islands have an average water temperature of 80 °F (27 °C) and see the most tourists between December and March. 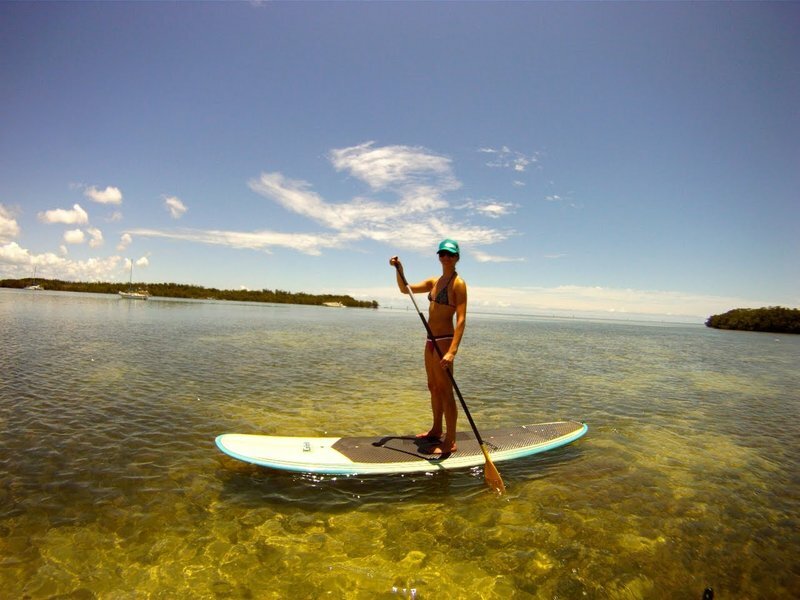 There’s no better way to explore the pristine wetlands and hidden turquoise waterways of the islands than on a SUP. The calm waters and white sand beaches make Grace Bay a paddle boarding paradise. Chalk Sound National Park and its landlocked lagoon is another picturesque spot to paddle. Often referred to as the stand-up paddle boarding capital of Europe, Portugal does indeed offer a wide variety of waters. With 1,115 miles (1,794 km) of coastline, there’s a huge potential for surfing, SUP and other watersports. Even better, there are plenty of top-notch SUP spots within striking distance from the country’s capital. One of them is the popular seaside resort of Ericeira. Paddle the majestic Rio Tejo, which empties into the Atlantic at Lisbon – there aren’t many places in the world where you can SUP round an 800-year-old Knights Templar Castle. South of Lisbon, Luiz Saldanha Marine Park offers a unique experience – it is like paddling in an aquarium with more than 1,000 species, with an astounding visibility of up to 70 feet (21 m). The turquoise waters here have quite a few bottlenose dolphins as permanent residents. For a change of scenery, take a SUP ride inside the Benagil Cave in the Algarve. There’s no doubt that Costa Rica is a surfing mecca that’s on everyone’s bucket list. But I’m here to tell you that stand-up paddle boarding is gaining serious ground on the tropical country’s coasts too. Tourists who do not fancy the idea of spending days in a row learning to catch a wave now have the perfect alternative – SUP. Playa Danta in the Guanacaste region is a secluded, off-the-beaten-path flat-water bay abounding in exotic sea life. It is also one of the country’s premier SUP spots. There’s more to Playa Danta than surfing. For adventure lovers, there are zip lines and ATV rides through the surrounding jungles. And please make sure you bring your snorkeling gear along. With water temperatures ranging around 86 F (30 C) all year, Costa Rica truly is a paradise found. North America’s largest alpine lake is perhaps the most photographed SUP location in the world. And with good reason – its mesmerizing blue water, 72 miles (115 km) of shoreline covered in coniferous trees and the snow-capped Sierra Nevada Mountains in the background make it a dream destination for a variety of recreational activities. What better way to enjoy this natural beauty than on a laid-back paddle boarding session? The crystal-clear waters of Lake Tahoe offer an astounding visibility of up to 70 feet (21 m) down on a good morning. Conditions are great from late spring until early fall, and the best time of day to paddle is in the morning or early evening. That’s when the surface is calmer and the winds are gentle, ensuring an intimate experience. These conditions are also ideal if you’re a beginner. Lake Tahoe is the venue of the annual Tahoe SUP & Paddleboard Race Series, an annual event worth attending if not even participating in. Would you like to take your stand-up paddleboard around the world? Now you know where to start! 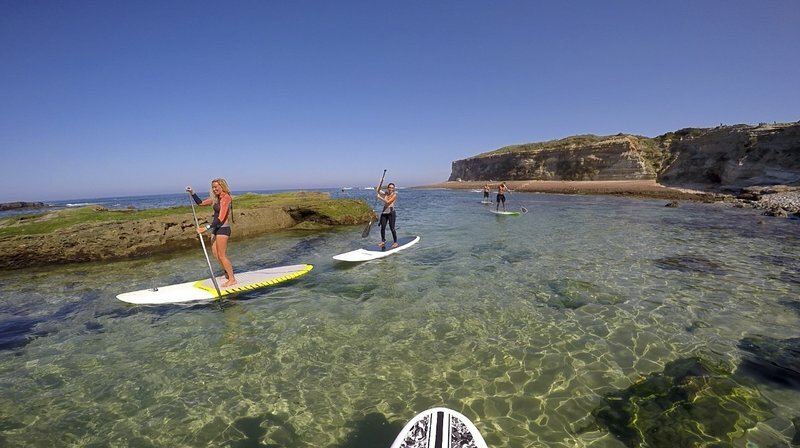 So head to BookSurfCamps.com and choose your next SUP holiday. Octavia writes for BookSurfCamps.com, the largest surf travel website with 2056 unique listings in 244 destinations around the world. This post is not about Facebook or Instagram. Instead, it's purpose is to encourage you and your friends to spend some time paddling together. We've found that it can be lots more fun to paddle with friends. If you’re short of paddling buddies, I would suggest joining a local Meetup or SUP club. Paddling events are never hard to find, and many sites have social paddles on a regular basis. Not only will you meet new people, you get the benefit of learning from others! Some events also allow you to participate in fundraisers and water clean-up events, which is a great way of giving back to the community. Research continues to show that spending just an hour or two on the water is beneficial and will have a positive impact on your life. Getting away from phone and computer screens and spending time building a healthy body and a positive mind just an hour or two a week can make a significant impact. Enough reading, it’s time to get out on the water with some friends. Surfing feels good. There’s no denying that. Time slows down when you’re riding a wave, you don’t really think about anything and the rest of the world just vanishes. You are in awe. You are in the flow. But what does that mean, and how does that translate into your brain activity? Our mind is the ultimate puppet master. It controls our emotions, fears, decisions and thoughts, our motivation and energy levels. What if we understood more about how our brain works? Would we be able to trick it into working more to our advantage? Exercising in natural environments has greater benefits for your mental health than exercising anywhere else. The same goes with surfing, a total workout that engages both the body and the mind, with health benefits that go far beyond the sheer thrill of catching a wave – it can be a form of treatment for depression, stress, anxiety, insomnia, and even post-traumatic stress disorder. Have you ever wondered what goes on in your brain when you surf? Looking for the science, logic, and reasoning behind the stoke you experience when out in the water? We often hear that “Only a surfer knows the feeling” and “There’s no greater high,” but that never seems to satisfy us. So, we’ve decided to get to the bottom of things and to take close look at what happens inside a surfer’s brain. Well, not literally, but we do have some interesting answers for you! According to Harvard Medical School, regular exercise improves memory by stimulating certain chemicals in the brain, which, in turn, help new blood vessels to grow and brain cells to survive. It also improves sleep and mood, and reduces stress and anxiety. The same happens when you surf – the brain gets a good shot of some cool chemicals. Adrenaline – In medical terms, this is called epinephrine, and is being produced by the adrenal glands in response to danger and fear. There is another hormone, very similar to adrenaline, called norepinephrine, which is produced by the brain. Just like adrenaline, it triggers the fight-or-flight response, increasing the heart rate, the breathing rate, and the blood flow, helping you deal with stressful situations. Serotonin – Also known as the “happy chemical,” this neurotransmitter is responsible for our mood. Low levels of serotonin are associated with anxiety and depression, and higher levels of this mood enhancer reduce stress and increase your overall confidence. It is also responsible for that stoke you experience during and after a surf session. Endorphins – These feel-good chemicals are often referred to as the body’s natural painkillers, masking pain and discomfort, and helping you power through any situation. Release of endorphins is also linked to a state of euphoria. In fact, surfing is used in rehab facilities, where the high from drugs and alcohol is replaced with the endorphin rush one experiences when riding a wave. Dopamine – Even more powerful than endorphins, this neurotransmitter controls the brain’s reward and pleasure centers. The anticipation before a surf session releases dopamine, with incredibly high amounts being produced as the result of an unexpected success, such as catching your first wave or riding that gnarly peak you never thought you could. Dopamine is associated with addiction because it keeps you coming back for more. For centuries, doctors have recommended beach sessions to their patients. The ocean has a naturally soothing effect on the brain, and simply being around crashing waves will make us feel at ease and happy. But have you ever wondered why this happens? The crashing waves release negatively charged ions, which trigger the release of feel-good chemicals in the body and alter the brainwaves. Negative ions cannot be seen with the naked eye or smelled, but they are around us in certain environments, especially around large bodies of water. To be more precise, these are oxygen atoms with negatively charged electrons that are produced through water molecules. Negative ions are nature’s anti-depressant, triggering the release of serotonin and endorphins, those magical neurotransmitters that relieve stress and make us feel good. Negative ions increase the flow of oxygen to the brain, which leads to mental sharpness and increased mental energy. They also promote the activity of Alpha brainwaves (keep reading to find out more about these). Therefore, it’s not just the pleasure of catching a wave that will put a smile on your face, but also the air you breathe. The breathing patterns used when swimming and diving stimulate the parasympathetic nervous system. This has an impact on the brainwaves and calms the mind, releasing hormones that make you feel positive. There are five types of brainwaves. In order from fastest to slowest, these are Gamma, Beta, Alpha, Theta, and Delta. Whenever we feel tired and lazy, the more sluggish brainwaves are dominant. When we feel alert and energized, the faster brainwaves are in action. When being faced with a wave, you need to be focused on the task at hand, and the brainwaves start to move faster. Gamma waves – the fastest brainwaves, Gamma waves are associated with memory, learning, and processing tasks quickly. Beta waves – come into play when a sharper state of alertness, logic, or reasoning is necessary. Beta waves are associated with increased focus, but too much Beta waves can also lead to higher levels of stress. Alpha waves – when we are relaxed or daydreaming, the Alpha waves are “to blame”. This frequency is at the borderline between the conscious and subconscious mind – when Alpha waves take over, we experience the flow state. Theta waves – usually occur during sleep, but can also take over during deep meditation. Theta waves allow us to process information beyond our normal consciousness awareness, improving our creativity and intuition. Along with Alpha waves, Theta waves help you enter the flow state. Delta waves – the slowest and the loudest brainwaves, these dominate during dreamless sleep or transcendental meditation. Experiencing awe quiets the frontal lobes, syncing the left and right brains, increasing Alpha and Theta brainwave activity. The state of flow is reached when the Alpha and Theta brainwaves take over, and could be described as the point where the conscious and subconscious meet. When focusing on a task, be it catching the next wave, writing a great paper, or delivering an awesome project at work, we start with Beta waves and slowly progress towards Alpha and Theta. When Alpha wave activity increases, we are reaching our peak performance. When intense creativity is involved, Theta waves come into play and we get an “aha! moment” – that precious moment of brilliant ideas, when we are able to connect all the dots. We know now that meditation doesn’t necessarily imply sitting still in a quiet room on a braided cushion. It can take many forms, and surfing is one of them. Simply gazing at the ocean puts you in a meditative state. Once you get in the water, surfing forces you to direct your thoughts to the present moment, clearing your mind. Surfers undergo dissociative states, similar to those experienced by lifelong meditation practitioners. After the rush of chemicals in the brain, the parasympathetic system takes over and everything slows down, while cortisol (stress hormone) production stops. Alpha brainwave activity dominates, which translates into a relaxed state of mind and clearing of unwanted thoughts. That restless monologue in your head suddenly stops. Surfers continue to feel good long after a surfing session and will be able to focus better on all the other tasks they are faced with. We cannot really tell what goes on in every single surfer’s brain; that would imply mapping their brains, and we can’t exactly hook a surfer to an MRI while inside a barrel. We are all unique, and what we feel in a particular moment is influenced by our life experience and by the different challenges we face. What a beginner surfer may see as over their limit might seem too easy for a pro. But in the end, it is the diversity of the experience that makes surfing such an amazing sport. Get your shot of all-natural feel-good chemicals more often. Embark on regular surf weekends and try to squeeze in a session or two during the week if you can! This post was made possible thanks to the folks at BookSurfCamps.com, one of the largest surf travel websites with 1966 unique listings in 244 destinations around the world. This past week I had an opportunity to visit Asheville, North Carolina and thought it would be fun to try paddleboarding a river, since almost all of my time has been spent in the ocean. The only problem was that the "official" season didn't start until April 7th, and the air and water temp was hovering in the mid 40's, but I was lucky enough to hook up with Kyle and Tom from Wai Mauna Asheville SUP Tours, who made it all work. Tom helped get me on the water, and explained what to expect on the river. The sport of river paddleboarding is growing rapidly among SUP enthusiasts from the advanced to beginners looking to expand their horizons into a challenging adventure. I didn't realize that there over 250,000 rivers in the US alone! Paddling down a river is a lot of fun but, before you go, take time to know the river and prepare based on your skill level. First of all, you will probably get wet! I actually wore my wet suit and booties, and although I never hit the water, I wanted to be prepared for a cold water dunk. Most river boarders will wear a wet or dry suit, water shoes, gloves and in areas with rapids, headgear. Rivers typically have accessible sections for all skill levels. Talk to the locals and hike the river first to scout out the section you feel comfortable with. The section i was on, had a nice flow and no visible rocks or other obstacles. I started by paddling up river, against the current and then enjoyed a nice float back down river to complete by "out and back" adventure. River currents are unpredictable and have under tows that can pull you under, or send you off in the direction of rocks, falls or fast flowing water. Therefore, you should wear a personal floatation device (life jacket) and helmet in areas that have rocks and rapids. If you do fall in, don’t panic. Lie flat on your board and use your hands and feet to move to the side of the river away from the flow. You should use a quick connect leash that attaches to your personal floatation device. Ankle leashes can get caught up and can be difficult to disengage from your foot. Once you found a part of the river that you are comfortable with, there is still some prep work. Obviously, you must get back to your original spot where you started. Similar to river kayaking or canoeing you will need a partner and a partner car. The folks in Asheville meet their paddlers 4 miles down river after dropping them up river. Once on the river, use the buddy system, if possible. Always be aware of where your partner is. Keep an eye on areas you can float to and get back on your board easily. If you do fall off, don’t try to get back on in the current. I found River SUPing to be very fun and relaxing and can't wait to go again! What's the hardest thing to learn about Stand up Paddling? The great thing about paddle boarding is that it is relatively easy to learn. Andre (first on the left) just moved to California from Venezuela and had never paddled before, but had skateboarded, and that helped him learn quickly. One of the hardest things is probably not starting at all. Like any sport or activity, the more you do it and practice the better you tend to get at it. With stand up paddling or SUP, a good way to start is to figure out what you enjoy doing on the water. Do you want to surf on your SUP? Are you more comfortable on flat water like a lake, river or inlet? Do you want to do it for exercise and relaxation? Do you have ambitions to race? Each of your answers will drive the experience of where you paddle and what kind of board you pick. Probably the hardest aspect is learning to balance and control your board in the water and the most efficient way to paddle. This can take a lifetime to do well. The first suggestion would be to take a lesson and rent a variety of boards to see what you enjoy. You can always reach out to: info@surfitlocker.com with any paddle related question you may have! We're here to help. This past August I made a day trip in North Carolina from Raleigh to Surf City, about a two-hour drive. My goal was to check out the coast and go paddle surfing. During the drive I experienced first-hand the contrast between the rural landscape of farms and what would be my final destination at the coast. I stopped at 50 South Surf Shop and rented a board. When I was done, I discovered some unique apparel with a chicken riding a surfboard called “Beach & Barn” I was intrigued. Ironically, back in California, many of my morning drives down to Monterey would take me by the neighboring farming communities on the way to the beach. I ended up buying a couple of their t-shirts to bring back to California. I was curious to learn more so I went online and discovered that Beach & Barn started out as a carpentry company, that morphed into an apparel company. That’s weird. I went on their Instagram account and there was a lot of tools, wood, and carpentry work on their social media posts, what gives? So I contacted them and ended up speaking to Rusty, one of the founders and learned about their history and asked if I could be one of their online retailers out in California. He said yes. As a result, we’re thrilled to feature their apparel this November. You can check out their entire collection here at: Beach & Barn. As always please let us know if you have any questions or would like to see us feature any other outdoor products at our Monterey, CA Location. The Aloha for People Story. Creating new ways to provide clean water and jobs for people in need. This month we've been featuring products from our friends at Aloha for People. The story of Brian and Emily all started when they read Blake Mycoskie's book Start Something That Matters that recalls his journey as the founder of TOMS Shoes. They were both incredibly inspired by his story and by the idea that a company could exist with a primary mission of helping people. They both thought, "We can do this. We can start something that matters." Their goal was to create a company that makes products they both are passionate about. Brian has an intense love of aloha shirts and the Hawaiian culture surrounding them and Emily studied apparel design in college. They decided to start by making aloha shirts that represented the culture of the people they hoped to help. This is the foundation of Aloha for People. They make products using fabric hand-woven throughout the world, including Guatemala and Nepal. With every product sold, they provide a child in need access to clean water for 2 years. Over the past year, Aloha for People has grown from an idea discussed in their living room to a fully functioning company with a line of products that includes aloha shirts, t-shirts, tank tops, surf fins, and surfboard bags. Starting with 600 aloha shirts, they have provided jobs in both the United States and Guatemala and will provide clean water access to over 800 children in Guatemala by the end of 2017. They have developed an incredible community of Aloha Ambassadors who represent their brand in an epic way and help to spread the aloha all around the world. We're thrilled to be one of their amazing retailers helping to spread the word. and support their cause. We both hope you love the shirts and the Aloha Spirit their products represent. The ocean effect – a simple way to get “surfer’s stoke” in your life. OneWave a non-profit surf community tackling mental health issues with a simple recipe...saltwater therapy, and surfing. “Surfer’s stoke” describes the blissful, Zen-like state that comes with catching and riding waves. This natural high is addictive enough that some people will quit their jobs, devote themselves to surfing, and call it a life. It’s also powerful enough to help people recover from addictions that are far more damaging. According to Saltwater Sessions activity in the presence of nature improves both mental and physical health, reducing stress, improving attention capacity, mood, and general well-being. Surfing produces a powerful rush of neurochemicals associated with happiness and well-being, including oxytocin, endorphins, and dopamine. This rush of chemicals aids in the reduction of stress and the enhancement of attention capacity and mood. Lessons learned in the water become skills for increasing emotional intelligence. The challenges of surfing mirror many of the challenges and stressors we face in relationships and in daily life. In these cases, healing on the water actually comes from replacing the excitement of addictive drugs with the natural dopamine high produced by surfing, whitewater kayaking, sailing, or paddle boarding. Surfing and similar sports satisfy the brain’s desire for stimulation, novelty, and a neurochemical “rush,” while also getting addicts out of their usual environments and providing new settings, new friends, and new routines. “The goal of surf therapy is not to teach people to be surfers,” says Bryan Flores, who works with the Monterey County Mental Health Commission. “It’s to get them to use surfing to change their brain chemistry. There are many online interviews with surfers in which surf board riders state what they love about the sport. Most health professionals acknowledge that surfing provides many health benefits including cardiovascular fitness, shoulder and back strength and leg and core strength. They also widely agree that surfing has mental health benefits including the provision of a good outlet for stress and tension. Anti-depressants, music and exercise are all important in keeping depression at bay…. and there are sufferers that will get benefits from the peace of the ocean and the joy of surfing. Just watching surfers enjoy their sport and approach the water with enthusiasm every time they jump in is uplifting. Watching the swell and predicting the best wave to catch stop the mind from wandering to low thoughts. And the thrill of riding that wave and the comradery developed with other surfers are powerful tools in stopping negative thought patterns. OneWave holds surfing sessions called "Fluro Fridays" where surfers wear the brightest colors possible. It is believed that doing this makes you smile and out in the surf is a good conversation starter to open the door to discussions for mental health sufferers and their careers…and family and friends who are all effected in some way by mental health issues. Whether you are surfing alone or as part of a club or competition don’t forget the most important thing is to have fun. If you’re feeling down and lonely, give surfing or paddle boarding a go….it might just work miracles for you too. The more you paddle, the more you'll encounter windy conditions. We found some great tips at paddling.com, that we've highlighted below. One of the most important techniques that you can learn for stand up paddling is actually how to lay down and paddle against the wind. If the wind picks up, and you can no longer move forward, you'll want to lay down, put the paddle underneath your chest, and alternate with your arms right and left, to paddle forward so that you can actually get below the wind, and make some way back to your destination. Another way to paddle, should you need to get upwind or if you need to get through an area that isn't conducive to standing up or might present a danger, is to get down on your knees, and paddle your board like you would a canoe. Bring your hands down the paddle, so that they're much lower than they're meant to be, and reach out and basically use the same technique so that you can get yourself out of danger, or until a more suitable area where you can then stand up. One of the biggest dangers to stand up paddling is off shore winds, meaning winds that are blowing from the shore, out to sea, or out into the lake or river. Off shore winds can be very dangerous to stand up paddling. The wind plays such an influence over which direction you travel, especially when you're first learning. You'll want to make sure you don't get yourself out to sea, and if you do, you know the correct methods for getting yourself back in against the wind. On shore wind is the wind that blows from the water onto the land. If you're learning in the ocean, shore break can be a very dangerous hazard. Make sure that you watch the break prior to entering the water, and time it so that you go out to the minimum amount of waves as possible, and get yourself as quickly as possible out through the breaking zone into the clear water where the waves are not breaking. Should you become caught in the shore break, always let the board go inside of you. What you don't want to happen is to have the board in between you and the wave, and get hit by the board. In that scenario, the best rule of thumb is to save yourself first, and go collect your board back up on the beach. What's the best way to get past the waves on a paddle board? If you watch any experienced surfer you'll notice that they do not go into the water right away, but most often spend a good amount of time just looking out and getting a feel for the waves on a particular day. Every day is different. What is the wind doing? Is it off shore or on shore? What is the current tide? Are there rocks or other surfers or swimmers in the area? Finally, how are the waves breaking and what type of "sets" are forming? As we get ready to open our first location on Monterey Bay, we are well aware that getting a paddle board past the beach break requires some skill and good timing. Here are a few tips for limiting the damage to your body and board as you adventure out into the water. 1. Stay on your knees until you are well past the breaking waves. Be prepared to paddle hard and fast so that you can get over the waves before they break. As you get more experienced you can paddle standing up on smaller waves, for larger waves it is best to be off of the board and push the board over the wave as you dive through. 2. Be sure to aim your board directly into the wave, so that you can pop over smoothly, if your board does get turned side ways, make sure you protect your head and dive away from the board as it hits the wave. 3. If your timing is off and you see that the wave is going to break on you and the board, dive under the wave and use the leash to pull the board back to you after the wave has passed. 4. The advantage of watching the wave sets, is that it gives you a good indication of the best time to go out to minimize having to paddle against the bigger waves, especially when they are breaking quickly one after another. 5. Be patient. Sometimes it is better to wait a bit and then paddle out when you see a lull - rather than fight against a big wave set. 6. When heading back into shore, always be aware of any waves building behind you, so you can anticipate where they might break. Patience is again important and timing is key, especially on big days. 7. Practice. Nothing is better than experience and practice to help you feel more comfortable in a specific location. 8. If you are just beginning, consider taking a lesson - you'll learn valuable skills that you can then practice. 9. Respect the power of the ocean. If you have any doubts or if the water is crowded with swimmers in the surf line, don't go out there. Wait until the conditions are safer. Eating three nutritious meals a day can make a huge difference in your daily work out. Whether it's running, weight lifting, or swimming, it is extremely important that you eat the right food fit for your personal workout. Of course you've heard of "carb loading" (bread and pasta) as runners often do the night before a big run. Is this the best idea to do the night before you go stand up paddling? The reason why runners eat dinners full of carbohydrates before a big race day is because their bodies need a source of energy in the form of carbohydrates to store in their muscles (glycogen) on the race day. The truth of the matter is that your body should already have extra stores of glycogen in your muscles, before your giant spaghetti dinner, especially if you are following a consistent training program. It isn't bad for you, though. Eating carbohydrates can actually help you out as a stand up paddler. For a 150-lb athlete, the goal should be 450-825 grams of carbohydrates per day in order to not over-do it. But what is good for the stand up paddlers out there? 1. Eating simple carbohydrates within 30 minutes of the end of a workout will immediately replenish lost glycogen stores. 2. A small amount of protein taken immediately after you exercise is sufficient to support muscle repair and immune function. This includes eggs, protein shakes and recovery sports drinks. 3. One cup of orange juice with some raisins right after your day of paddling. It'll give you just the right amount of energy for the drive or walk home until you can get a sufficient meal. 4. As for dinner, try eating a spinach salad with tomatoes, chickpeas, green beans, and whole grain bread on the side with a main course of whole grain pasta and tomatoes. Eating the right thing can greatly impact the way that you paddle out there. It's important to have a good amount of energy when you're standing on that board! Sources say that of all of them combined, nearly 7% of the land in the USA is actually water. Of course you probably know that Hawaii is made up of many islands, so they have around 41% water and 49% land; however, I bet that you didn't know that the state of Wisconsin has a whopping 17.3% to 82.7% land ratio. Why is that? Wisconsin's largest lake is Lake Winnebago. It covers a whole 215.2 miles! To put it in perspective, you'd have to drive three and a half hours at 60 miles per hour just to get around the lake one time. Lake Winnebago is home to ice fishing in the winter, summer concerts, boating, and you guessed it--stand up paddling. There are companies that rent and sell stand up paddle boards to customers on small rivers and bigger creeks flowing into Lake Winnebago. Wisconsin's SUP is mostly through marshes--a very different way of paddling than in places like California. These marshes are typically beautiful. There are tons of nature and wild life to see. Maybe one day, you can see it for yourself! So, What is Necessary for Stand Up Paddling? Many people forget that weather is contantly changing--especially in places such as San Fransisco--so it is extremely important to remember that you must pack for unpredictable weather. It is really important to note that layering can be helpful. The best and most efficient way to layer clothes is to wear a thin, waterproof layer on the base. This prevents discomfort from occuring when things get wet (which they most likely will!) The next layer should consist of an insulating layer, such as a wetsuit if the water is cold, or just clothing that won't be blown easily by wind. Clothing can get caught in thw wind and can completely change the way you travel. Make sure to be careful when you're out there! Bring the right clothes for the right occasion and be prepared for sudden weather changes. As mentioned before, wetsuits are crucial when paddle-boarding in cooler weather, such as places like Canada, Alaska, and Oregon. They are great because while keeping you insulated and warmer than without one, they also are tight-fitting, preventing wind from catching you and making you slow down or go backwards. They are not as important in places such as Hawaii because the weather is much nicer there. If you know going into a day of paddle-boarding that you're naturally a "cold" person--that is, you get cold easily--you should rent or buy a wetsuit to prevent you from freezing and not having a good time. Pro-paddle boarders tend to remember this one, as it saves boards from getting eaten by large waves and getting lost, but a lot of beginners may not realize a leash's importance. Leashes, whether the water is calm or not, can be important for saving your board from getting lost due to high wind speeds or high tide/surf. Leashes attach around you ankle and to the back of the board. They are the best way for beginners to get back on their boards because they will always be attached to the person. A lot of paddle-boarding locations will supply them for you with you board, which makes it a lot easier and less of a hassle to find one. Don't forget a leash when you go out on a board! A dry bag is essentially a wetsuit for all your important items that you feel as though are important to have while paddle-boarding. A phone, wallet, keys and energy bar may be necessary, and a dry bag will keep them dry! This one may seem self-explanatory, but there are much more to them than you think. Many beginners will often rent them from wherever they got their boards and paddles from, however, if a beginner realizes that they might just go out and buy a paddle-board on their own because they like it so much, they should also invest in a nicer life jacket. These are good because often times they have water-proof pouches (basically dry bags) to put things in such as phones, wallets, energy bars and other important items to the owner. Life jackets are extremely important while on board!